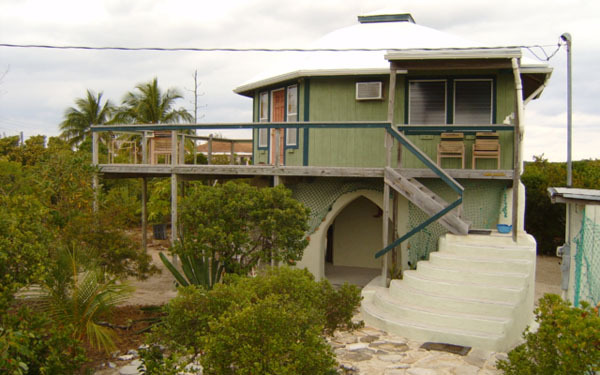 Steve and Carol Escott’s hurricane resistant earthbag house in the Bahamas. Earthbag building is perfect for constructing storm resistant affordable housing in hurricane and tornado regions. Steve and Carol Escott’s house for instance has been through numerous hurricanes with no serious damage so far. “When the Mississippi floods, people use earthbags to hold back the water. And when you buy a sack of oats for your horses, it might come in a polypropylene bag—the same kind that they fill with sand or soil and use to direct the flood waters. Did you know you can build permanent structures with the same bags? In fact, you can get the material they make the bags from in a big roll—it is one long continuous tube at that point! This is before they cut it into smaller pieces and sew it to make bags—and that’s often even easier to use than the bags!